Shoemakers Clarks have announced that they will shortly be resuming the production of shoes in the UK by opening a brand new factory in Somerset. They last made shoes in the UK in 2006. What has brought on the turnaround? And should others look at doing the same? Since I first had the idea for Make it British in 2008 it was apparent to me that the British high street would not be able to continue sourcing everything from the Far East with the rate that prices were going up in China. Having been a buyer for some of the big store groups I had seen cost prices double in a decade. And I knew that once all undue overheads had been stripped out of the supply chain the only way for prices to go was up. I knew that in the next ten or even twenty years, as the cost of overseas production continued to rise, that UK manufacturing would return. That’s why I set up Make it British in 2011, as a platform for supporting and promoting the manufacturing that we had left in the UK. Since I launched Make it British I’ve had many conversations with big retailers right through to start-ups about their UK sourcing strategies. Everyone is looking for local factories so that they are no longer entirely reliant on overseas sourcing, especially since Brexit. Not only does making in the UK protect against the unpredictability of foreign currency rates, but it also helps to ensure that a business is not holding loads of stock, as orders can be place closer to when your customer wants the product. Fashion retailers such as ASOS and BooHoo have gone from strength to strength by making more in Britain. In fact, BooHoo source 50% of their product from UK factories. However, the problem is that big sewing factories with rows and rows of machinists, like those in China, just don’t exist in the UK. The largest sewing factory here has probably no more than 150 machinists, and they make furniture covers not clothes! When it comes to clothing factories, those with the most machinists are generally making exclusively for their own brand, such as David Nieper and Barbour. And even those that once made exclusively for others, are now creating their own in-house brands, such as Private White V.C. in Manchester. Don’t look for one that already exists, because it most probably doesn’t. That’s why what Clarks is doing is spot on. They’ve realised that if they are to resume any volume manufacturing in the UK they need to own their own factory. This cuts out the costs of intermediaries and means they can put what they want on the production line, when they (and their customer) want it. It does of course mean a larger investment at the beginning, but will pay reap rewards in the long run. As skilled labour is now in such short supply, one of the best ways that UK factories can set themselves up for the future is by investing in the latest technology. Automation has worked wonders for the UK car industry, where companies such as Toyota and Nissan use robots on the production line. Clarks will apparently use robot-assisted technology in their new factory in Somerset, and will employ technical managers to oversee production. This use of state-of-the-art technology to make production efficient is something that is already working for some of the UK knitwear factories, as well as enabling cotton spinning to return to the UK at English Fine Cottons. Clarks have taken a brave move, and I hope that it will encourage others to follow suit. It takes courage to make such a big investment, but I think it will pay huge dividends in the end. The growing Chinese middle class don’t want to buy product made in China anymore, and the customer is getting more savvy to ‘British brands’ that don’t actually make in Britain. That, together with an increasing interest in sustainable and transparent supply chains, and a demand for faster turnaround of product, makes UK manufacturing once more a very viable prospect. Did you enjoy this article? Don’t miss out. Receive our weekly newsletter and get updated when we publish new posts. ← What to wear to Wimbledon…and everything is made in Britain! I live in Somerset and from a manufacturing background being a time served engineer. The Clarks outlet is a great shopping area but always saddens me to remember that the shops where once factories with real jobs creating real wealth. Great news which I hope will forma revival of Triumph Motorcycle proportions. Will certainly encourage me to buy even more Clarks shoes. Fantastic news ,will be lovely to see Clarks back home again where it all began . Excellent news and well done Clarks! Let’s hope this now inspires other companies to repatriate their manufacturing to the UK. I love Clarks and just bought a pair yesterday I have about 8 pairs of dessert boots and at least another 8 pairs or other Clarks shoes! It’s great to see them bringing manufacturing back to British! I hope they stamp made in Britain big and bold on there shoes! Maybe even the union jack! Can’t wait to see the return quality British manufacturing! I love Clarks and just bought a pair yesterday I have about 8 pairs of dessert boots and at least another 8 pairs or other Clarks shoes! It’s great to see them bringing manufacturing back to Britain! I hope they stamp made in Britain big and bold on there shoes! Maybe even the union jack! Can’t wait to see the return quality British manufacturing! Brilliant news and well done Clarks for making this move. Let’s hope others see the logic and start investing in the UK’s manufacturing industry and the working people of this country. Let’s see lots more apprenticeships too; we need to show young people that being in manufacturing is just as valuable as being an academic! This is super news! Clarks is an iconic British brand that must be made in Britain. I can’t wait to get some real British shoes again! British and Best! I worked in garment manufacturing for 25 years, right through the whole ‘moving offshore’ period. And I always thought chasing the cheapest labour was a mistake as we lost tens if not hundreds of thousands of skilled workers who could make better quality product in the UK. However, I would not celebrate the fact that Boohoo and ASOS use UK factories as many investigations have uncovered dreadful working conditions and pay, the like of which should not be allowed anywhere in the world, never mind here in the UK. Fast Fashion needs to change, our whole retail system is unsustainable, especially when we take into consideration the environmental factors. Patagonia and other premium brands have a good solution in selling product guaranteed for life with free repairs if ever needed. Of course that does not address fashion, which is transitory in nature, designed that way to get us to keep buying clothes. A seismic change in retail/buying needs to happen however there are few leaders stepping up to address this issue. I agree with your fears and I think we should be involving the customer in making more sustainable choices. Everyone deserves a job and a living wage and if they cant get it people wont be able to buy anything. Even China is now chasing the next low cheap labour source with its Silk road plans and this is unethical. Mind set change needed from all points of view and the acceptance that economies can prosper with constant low growth instead of these exploitative actions to achieve high growth which then inevitably slumps. I miss the quality of products that came from skill and pride in work, what I see now is products that don’t last long and that have been pushed out for a quick profit. If I really like something I want it to last and don’t mind paying for for someone’s skill and time, perhaps I am unusual? Great news. I will start buying Clarks once again. 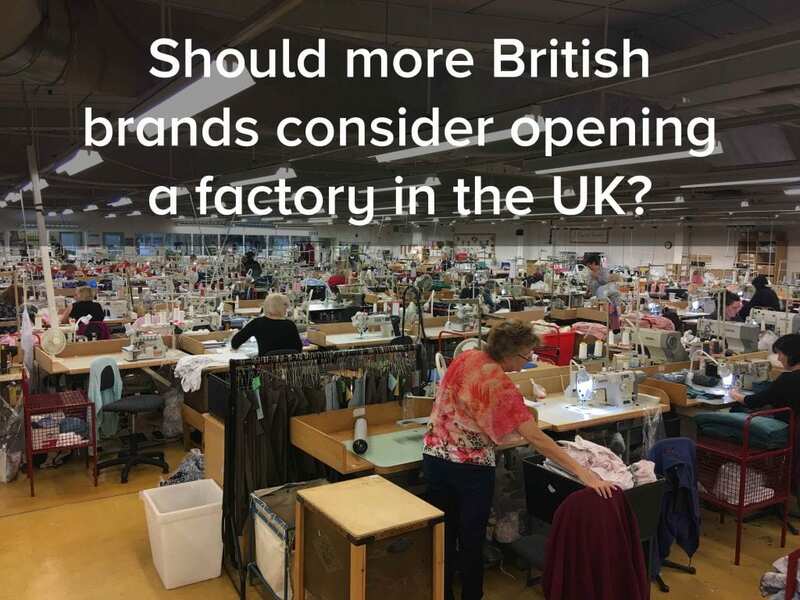 We definitely need more factories in the UK, M&S are just one, they clothing does not have the quality they used to be everything made abroad. Great news and hopefully more manufacturers will follow suit. In my opinion Clarks have gone downhill in recent years so hopefully they will be back up to the standard they used to be. Great article and well done to Clark’s. Their shoes are well made and good value. We need strong brands to lead like this. So happy to hear Clarks are coming back to somerset I live in Ilminster where Clarks used to have a factory it was so sad when they shut down. Hopefully other British manufacturing will make comebacks ?? My g’daughters just had a pair of Clarks (student quality) shoes for school, she is 13yrs size 5 and they cost £49.99. It is disgusting, this is the last pair of Clarks she will have. I just bought a pair of Billy Ruffian boat shoes. Now I have an excuse to buy a pair of Clarks dessert boots next! Well done for making a decision to produce domestically again. I always bought Clarks shoes until they stopped manufacturing in the UK, then I had to source my shoes from other UK manufacturers, not always easy. It now looks like my choice in shoes is going to become significantly wider. I am looking forward to the first new British Clarks Shoes being available in our shops. Great news for the local area and also for British manufacturers like us. We produce storage and handling equipment to factories across the UK and the more companies that decide to produce in the UK the better for us and a whole host of other related businesses and suppliers. Love Clark shoes live in USA was disappointed when they started making the fine shoes in China could tell the quality was not the same. So happy to know you are coming home should always be made in UK great news. Will be the best for everyone. As the world evolves into a less stable climate the ability to manufacture at home will become increasingly popular and a necessity. If products are made abroad and hostilities break out the ability to get your product made will more likely cease and the initial benefits of having your product made in this chosen location could become a new headache you hadn’t contemplated. Many years ago I had a product made in Asia, an earthquake meant no products were made for six months, the stress and financial impact were beyond contemplation. I learned a hard lesson and one I will never revisit, I support my country and value all it has to offer. It is also so much easier to bring in component parts and assemble the product here where quality and control are under one roof. We have the most talented and skilled people in the world and are held in the highest esteem for our products. The large department stores were welcoming of the higher prices to stock the British made products as they felt the quality was a lot better and shoppers were asking for the British made goods. I love Clarks shoes and am so please that they are returning, I hope this will be the start of many who relocate back just as Dyson did a couple of years ago. I would be more happy with the news if it wasn’t including the robots stealing jobs part, there must be other under 25s like me who would happily train to be a machinist in return for bringing some life back to rural factory towns? I had bought clark shoes at least 5 pairs this is one of my favourite shoes.